Fine Art Shippers has been providing comprehensive art transportation services for more than two decades. Over this time, we have established ourselves as trusted art logistics experts able to offer a smart and innovative solution to any art shipping problem. For today, Fine Art Shippers works with many art business professionals, from dealers and auction houses to cultural institutions, providing them with a scope of art transportation services both nationally and internationally. Besides, being art collectors and connoisseurs ourselves, we spend much time visiting various galleries in NYC and beyond. In this blog post, we want to tell you about one of them – the gorgeous Kim Foster Gallery, which is definitely one of the best Chelsea galleries offering contemporary art! 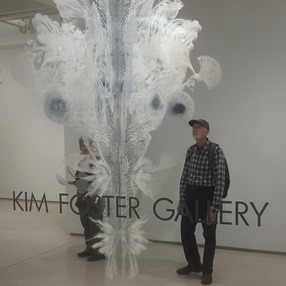 Kim Foster Gallery was opened by Kim Foster in 1994 in Soho, but in 1998, the gallery moved to its current location in Chelsea, at 529 West 20th Street. Today, Kim Foster Gallery is a must-visit place in the district, largely due to its elegant exhibitions of thoughtful visual art, which are not only beautiful and well-curated but also intellectually challenging. Moreover, this Chelsea gallery represents some of the most talented contemporary artists from all over the world, including Margaret Evangeline, Deborah G. Nehmad, and Chun Kwang Young. At Fine Art Shippers, we are always ready to offer our art transportation services to everyone purchasing art from Kim Foster Gallery or any other gallery in NYC. Just give us a call, and we will deliver your new acquisitions quickly and affordably!